Tiffany has written several books on a variety of topics. Browse her books below and go here to purchase. A Scripture-rich guide to deepening our faith, Our Happy Ending Starts Now: Trusting God to See Us through the Tough Times helps us to develop the spiritual endurance we need to face our life’s obstacles. If we are honest with ourselves, we might admit that the holiday season sometimes ends up being a very un-happy time for us. There’s too much to do, too many people to impress, not enough time to accomplish what needs accomplished, and little return on our efforts (or so it seems). 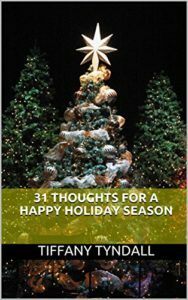 31 Thoughts for a Happy Holiday Season is your answer if you are looking to transform a less-than-joyous internal drive into a positively motivated enthusiasm when faced with the upcoming holidays. We know intellectually that we are supposed to be happy during the holidays, so why is it so hard at times to actually turn on the happiness (to engage our feel-good emotions) even when there’s so much of it around us in the air as the season unfolds? Tiffany offers some thoughts that will help you get un-stuck this season as you prepare your heart and your home for the most wonderful time of the year. 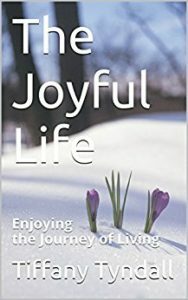 The Joyful Life: Enjoying the Journey of Living helps readers to live a more abundant life in two ways: by deepening our understanding of the word joy as it appears in biblical reference and by giving us practical ways to activate joy in our lives. Weighted in logos and pathos, The Joyful Life: Enjoying the Journey of Living appeals to both our intellect and our hearts, thus making a life of joy something we not only understand with our minds but also something that we want for ourselves in our deepest place of desires. 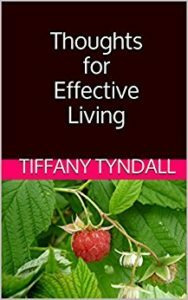 With regard to joy, Tiffany Tyndall gives us the building blocks, the tools, and the strategies to more fully grasp our ability to actualize it in our lives. Tiffany encourages us to enjoy this life that we are living now, in this present moment, regardless of disappointments, disruptions, distractions, and difficulties. As we progress through our journey of self-development, which includes making strides in personal recovery, we will eventually get to a place where everything starts to blossom. At this point, we may notice that we are the only one around who is experiencing the abundance of the good life. It can feel lonely, but we don’t have to despair about it. 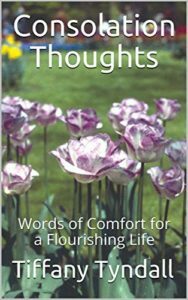 In Consolation Thoughts: Words of Comfort for a Flourishing Life, the author shares insights that have helped her to keep going on the road of emotional healing and onward to a fuller expression of personality, potential, and unconditional love for her family. As we go through the magnificent yet humbling experience of parenting our children, we will find that there are certain enduring truths that present themselves to us, if we are listening, that will show us the way and will help us get better and better at this joy-filled yet long-suffering job as we go along. 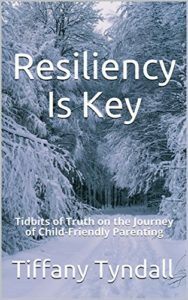 This book, Resiliency Is Key: Tidbits of Truth on the Journey of Child-Friendly Parenting, contains these such truths—bits of wisdom that became apparent to the author as she made her way the best she could through the season of parenting her three children when they were young. If you have had to break away from toxic influences in your life, this book will be all the more encouraging to you because it will remind you (and help show you how) to be your best so that you avoid slinking back into the familiar yet ineffective habits that you might have picked up from your own childhood or from those close to you in your life. Resiliency Is Key: Tidbits of Truth on the Journey of Child-Friendly Parenting is a companion to (a “Volume 2,” if you will, of) Child-Friendly Parenting: Growing a Well-Functioning Family in a Home Environment That’s Good for Kids (No Matter What Your Home or Family Looks Like). 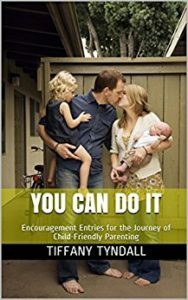 In the 167 entries contained in Resiliency Is Key: Tidbits of Truth on the Journey of Child-Friendly Parenting, you will find healing for your soul as you apply these truths to your everyday parenting responsibilities. Instead of feeling more and more pressed down by all that we carry (literally and figuratively) as parents who want to do right by our children, we can feel empowered and comforted as we more effectively empower and comfort our very own children. By listening to and putting into action the truths we encounter on our parenting road, we can learn how to, essentially, bounce back from tough times (because parenthood entails many-a-tough time) and keep walking the high road instead of staying pressed down and settling for the low road (as easy, and even understandable, as that might be). Furthermore, the truths in this book point us to a more constructive way to respond both to our children and to the overwhelming-ness that is an ever-present part of parenting so that we not only are doing right by them but that we are also doing right by ourselves as we seek to become more developed individuals. By unlearning destructive coping mechanisms and by replacing them with life-giving life skills that lead to a more flourishing existence, we can look forward to better days ahead, and we can better embrace the challenges we come up against—viewing them as valuable opportunities to grow and to show love to our families. I know, I know. We don’t need another book telling us how to raise happy children (or do we?). But what we do need is different voices contributing helpful thoughts as we go about finding our way through the process of nurturing well-balanced human beings. Happiness, healthiness, and groundedness are all part of that equation, so what I wanted to do is to make available some of my experiences in those areas and to share my way of thinking to achieve those outcomes in my family so that others, like you, can be encouraged on your own journey of effective parenting. So, on with the book description. 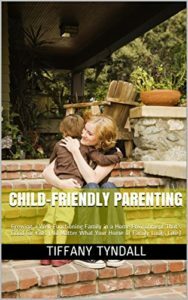 Child-Friendly Parenting: Growing a Well-Functioning Family in a Home Environment That’s Good for Kids (No Matter What Your Home or Family Looks Like) explores different aspects of parenting children in a way that contributes positively to their emotional health, happiness, and overall well-being. Addressing topics like assertiveness, self-regulation, and optimism, these writings aim to help parents become more confident and effective as we build trusting relationships with our children. Furthermore, the kind of parenting qualities that bring about the good kind of growth in children are the nurturing kind, so an emphasis is given to developing positive character traits in ourselves (as a way to model what we want our children to eventually adopt for themselves), like patience, kindness, empathy, joy, and gentleness. Other subjects are covered, such as handling meltdowns with composure, rejecting spanking as effective discipline, resisting victimhood in parenthood, breaking the cycle of parentification, considering the necessity of parental divorce (i.e., cutting ties with one’s own parent or parents) and seeking to achieve and maintain a power balance as well as emotional equilibrium in our family relationships. In these writings, you will find reminders of what often marks a child-friendly atmosphere: encouragement, creativity, freedom, reasonable boundaries and consequences, choice, being heard, and acceptance. You will also find affirmations, scripts, scenarios, and steps—but keep in mind that these are offered as examples of how to make progress in the path of child-friendly parenting and that each of us must find our own way through the woods (though we don’t have to do it alone, per se). In other words, what worked for me might not work for you, but I still wanted to share these things in case they spark an idea that turns out to be useful to you. The idea of “child-friendly parenting” is less about being a program or a system imposed on static goals and more about being a framework and an approach to a fluid and open process of growth, positive change, and self-development. What we are seeking to accomplish is to develop the skills we need as parents to be effective (in the long-term and the short-term) as our child’s main nurturer. Although this was written primarily with parents of young children in mind, many of these concepts can extend to strengthening the parent-child relationship at any age and stage of development. Understanding that relationship is first, we can proceed to brave anything and everything we come up against, no matter who we are, what we’ve come out of, or who our children are. 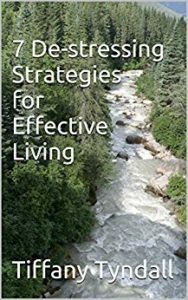 Thoughts for Effective Living provides a framework of self-nurturing thoughts for those who want more effectiveness, encouragement, and enjoyment in their life. Written as a way to document the dynamic of positive personal development, these thoughts are meant to be read slowly and then re-read as needed to promote mental focus in the midst of negative circumstances or emotions. What makes Thoughts for Effective Living different from affirmations, meditations, or confessions (which serve separate purposes of their own) is that these self-nurturing thoughts are professions of willfulness. Additionally, these are declarations of what the human will is choosing despite all else. Furthermore, these are reminders to keep going and to keep growing no matter what. And I can only change my choices. These choices include my outlook on life, my mindset in the moment, and my response to things that happen throughout the day and over the years. Despite the challenges I may encounter along the way, I will choose to enjoy my life – because I might as well – and to make the most of each day, as each day is given to me. 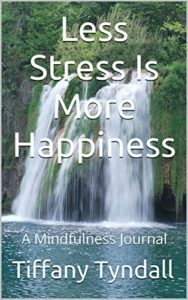 Less Stress Is More Happiness: A Mindfulness Journal captures one woman’s thoughts as she aims to recognize, manage, and minimize stress in her life. Tiffany Tyndall identifies five areas of attention that can help decrease stress as more awareness is given to strengthening our skills in these categories: physical, emotional, mental, the will, and spiritual. How to Disengage from a Highly Stressful Environment offers 20 ways to step back and regain your cool, calm, and collected self as you wade through a highly stressful situation. Tiffany Tyndall shares that the only thing we can really change is our choices in the moment, and she addresses these 20 stress-reducing strategies in a straightforward and easy-to-digest way. Written to be read slowly and re-read as needed, How to Disengage from a Highly Stressful Environment will help you find your anchor as you apply these response-to-pressure tips to your life. 7 De-stressing Strategies for Effective Living helps readers to find practical ways-that-work to lessen the load of stress on everyday life. Tiffany Tyndall shares seven strategies that will assist us in our de-stressing efforts as we seek to live effective lives as parents, spouses, friends, and professionals. Written to be read slowly and re-read as needed, 7 De-stressing Strategies for Effective Living guides you through the process of stress relief and encourages you to take action in realistic ways that align with your individual life circumstances. Stop picking up more of it. Release it (what’s already being carried). 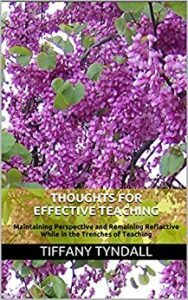 Thoughts for Effective Teaching: Maintaining Perspective and Remaining Reflective While in the Trenches of Teaching offers honest and practical ideas for making your way through the daily grind of teaching. These 13 reflective entries are meant to be read one at a time, over time (such as one each week), and time and time again so that the truths within them can sink in, take root, and have a positive transformative effect on the day-to-day teaching and learning process. The author’s expertise comes from her being a secondary English teacher in public schools with heterogeneous demographics; however, the thoughts shared may spark ideas in educators across all grade levels, content areas, geographic locations, and cultures. Loved: Writings on Motherhood and Caregiving speaks encouragement to women everywhere who find themselves immersed in the daily tasks of mothering their young children and tending to their homes. 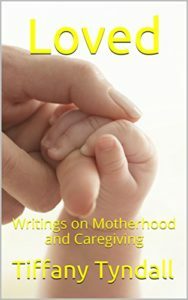 A collection of four writings developed during the author’s season of caring for her children in their early years, Loved: Writings on Motherhood and Caregiving reminds readers that one of the most important reasons why we do what we do is so that our family members feel loved – by us, by each other, and by our God. 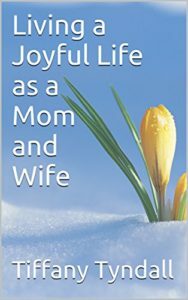 Living a Joyful Life as a Mom and Wife encourages readers to apply an open framework of enjoyment to their roles as mothers and wives, even when things get tough. The freedom to choose our mindset is what sparks joy in our hearts as we do what we do with love and great care. Good Mothering: Doing the Best Job You Can Despite the Inherent Difficulties that Come with the Life-with-Kids Territory is an encouragement to mothers everywhere to give it their best and then to let the rest go. 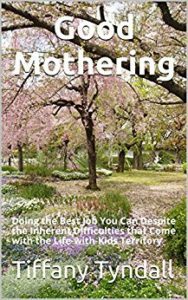 Written to be a gentle and humorous reminder to maintain perspective at all times, Good Mothering: Doing the Best Job You Can Despite the Inherent Difficulties that Come with the Life-with-Kids Territory helps readers to gain a restored heart and a renewed sense of purpose as they mother their young children. 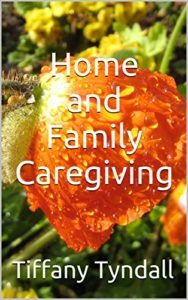 Home and Family Caregiving is a devotional-laden, journal-esque manual of what it took for one woman to care well for her home and young family. 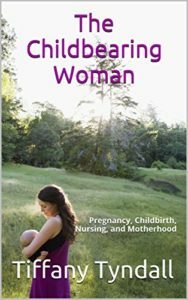 The Childbearing Woman: Pregnancy, Childbirth, Nursing, and Motherhood is an honest re-telling of one woman’s experiences of the hallmarks of bringing children into the world. 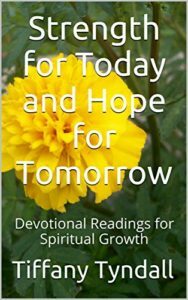 Strength for Today and Hope for Tomorrow: Devotional Readings for Spiritual Growth is a collection of five devotional writings focused on helping us turn our mind and heart towards God during times of transition and uncertainty. With an emphasis on helping readers live fruitful lives in the areas of faith, patience, kindness, forgiveness, and peace, Strength for Today and Hope for Tomorrow reminds us, in its 220 entries, to stay focused on what matters the most in life regardless of the challenges that we face. As we fix our lives on enduring spiritual truths, we will discover that we can in fact have Strength for Today and Hope for Tomorrow no matter what we are going through. 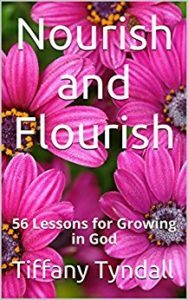 Nourish and Flourish: 56 Lessons for Growing in God gives readers insight into how to make their faith more personal and practical. 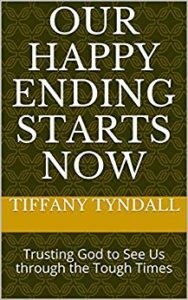 This devotional is also included in Strength for Today and Hope for Tomorrow: Devotional Readings for Spiritual Growth, a 220 entry collection of devotional writings by Tiffany Tyndall. 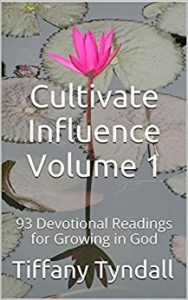 Cultivate Influence Volume 1: 93 Devotional Readings for Growing in God aims to help readers deepen their faith in God as they live in a way that reflects God’s good nature. Each entry includes a scripture verse, commentary, a prayer, and a positive confession. 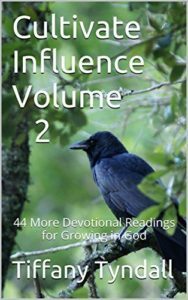 Cultivate Influence Volume 2: 44 More Devotional Readings for Growing in God aims to help readers deepen their faith in God as they live in a way that reflects God’s good nature. 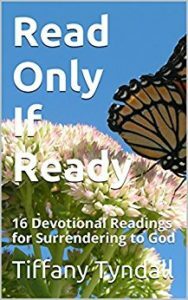 Read Only If Ready: 16 Devotional Readings for Surrendering to God encourages readers to come to God with everything and to exchange their old life for a new one in the Lord. 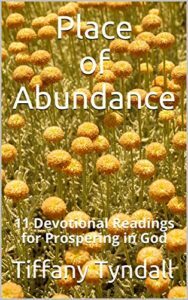 Place of Abundance: 11 Devotional Readings for Prospering in God helps readers to live out more fully the life that God has prepared for them by exploring spiritual truths and disciplines relating to topics like trust, choice, perseverance, thankfulness, and living a life that reflects God’s character.